But over the years it becomes more and more difficult to remember all of the symptoms, medications, aches, pains, childhood fractures, and other important details that can help you and your doctor properly diagnose and maintain your well-being. 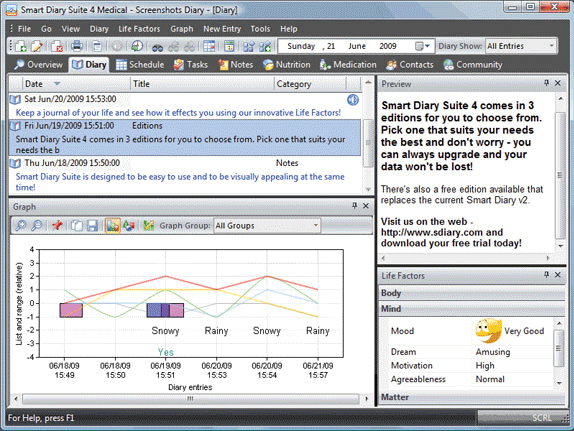 Smart Diary Suite Medical Edition lets you take command of your physical health and well being! With Smart Diary Suite Medical Edition, you'll be able to track any number of life factors, including diet, exercise, mood, energy level, prescription medications, and even your dream sequences! You'll be amazed when you start to see patterns and relationships form between different, seemingly disparate influences like your energy level and the weather, or your mood and what you had for lunch. 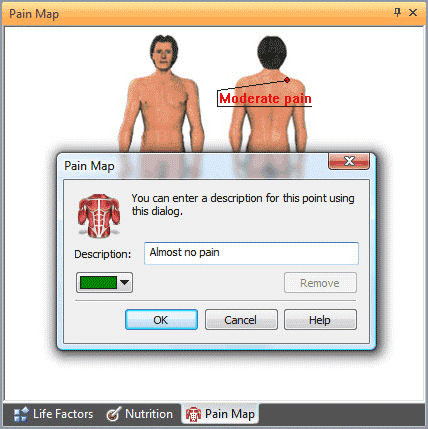 You can even use Smart Diary Suite Medical Edition to maintain a Pain Map to keep track of what hurts when, and see how your pain relates to your other life factors! 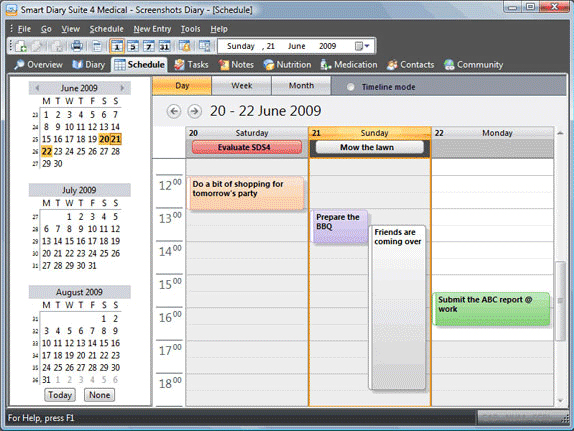 Smart Diary Suite Medical Edition also provides you with a built-in calendar to keep track of appointments and special dates, a task manager to help you set and achieve goals, a contact manager to maintain your network of friends and family, and a nutrition database that helps you to create and share recipes that conform to your dietary needs. Best of all, Smart Diary Suite Medical Edition includes a Medical Alarm function that will let you know when it's time for your medicine! Smart Diary Suite Medical Edition is your ultimate tool to consolidate everything about your life into one easy-to-use, accessible software package! 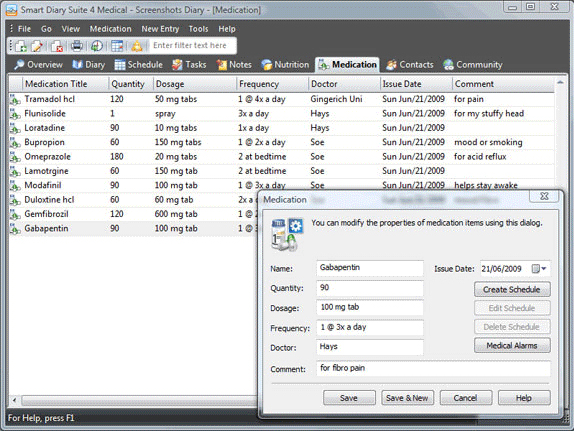 Trying to decide which version of "Smart Diary Suite 4 Medical" (Medical, Home, Lite) is right for you? Check out the feature comparison matrix and make an informed decision! Receive alerts when it's time to take your medication. Carefully track a variety of life factors like diet, exercise, mood, energy level, prescription medication, and even your dream sequences. Track and correlate your pain to other concrete life factors. Keep track of appointments, tasks, contacts, and nutrition. After you purchase Smart Diary Suite 4 Medical it may be used indefinitely. 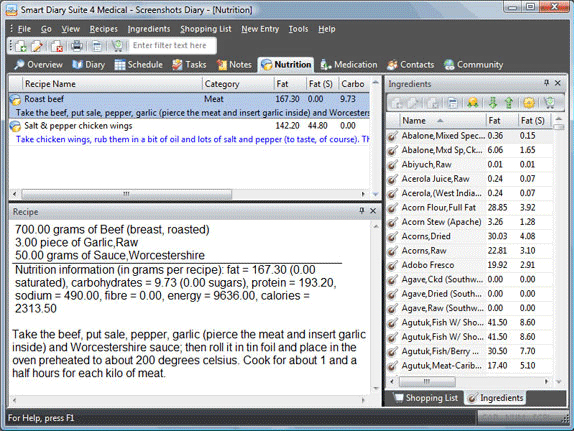 Smart Diary Suite 4 Medical is licensed per user, so if more people are going to use Smart Diary Suite 4 Medical you will need to purchase additional copies. 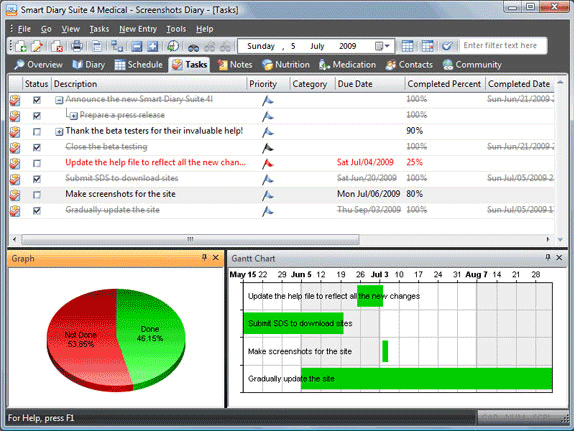 Each license allows installation on all owned computers, but Smart Diary Suite 4 Medical may not be used at exactly the same time on each of them. The Desktop Tools That Windows Forgot!